On 13 October, Fight Racism! Fight Imperialism! supporter Dominic O´Hara appeared once again in front of a judge at Glasgow District Court, the latest in a long line of court appearances for FRFI activists over the past year of political harassment, arrests and trials. 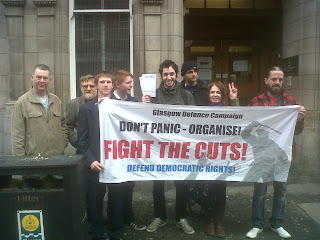 Fifteen supporters held a protest outside the court, standing with the banner of the Glasgow Defence Campaign (Don´t panic – organise!) and distributing leaflets to the many working class people coming and going through the revolving doors of sham Scottish justice. To illustrate the GDC´s point, after a leaflet found its way into the hands of a Strathclyde police officer, back-up was radioed in, a police van shortly arrived, the contents of the leaflet discussed and by the time supporters left the court the police van, a police car with its lights flashing and upwards of six officers were on the street outside. Such are the dangers of peaceful protest in Glasgow! Inside the courtroom itself, packed out by GDC supporters, the political targeting continued. As the defence solicitor began to address Judge Christie and ask for Dominic to be admonished after nine months on bail since being arrested on a student protest in December, the Procurator Fiscal (prosecutor) interrupted. A piece of paper was suddenly produced claiming that the defendant had committed a breach of the peace in April, while on bail. This outrageous fabrication was a clear attempt to secure a more serious sentence against an activist the police and the Crown would love to see remanded in custody. In reality, Dominic, two other FRFI activists and two young students were subjected to targeted house raids and arrests by Strathclyde police after Dominic was found guilty of a framed-up charge of police assault on 11 April. The pretext for this was a supposed breach of the peace at a Vodafone shop during the December protests for which Dominic had already stood trial. In a clear breach of the Human Rights Act, all those arrested were only released on an “undertaking” that they did not enter the city centre or “assemble with two or more people for the purposes of a demonstration”. After the GDC organised a militant demonstration against political policing, all charges were dropped. The disruptive tactics of the Fiscal resulted in sentencing again being deferred for another four weeks, prolonging a process which has already dragged on for almost one year. The entire justice system is designed to wear out and demoralise those who have the temerity to fight back and maintain their innocence – above all those charged for advancing working-class politics. Fight Racism! Fight Imperialism! and the Glasgow Defence Campaign will continue providing solidarity to all those targeted for organising in defence of the people and ensuring that there will be no business as usual for the suited and uniformed servants of the British ruling class. Court protests – no to political policing!